I’ve known the story since I was a kid. At my summer camp, which has an infamous socialist history, one of the bunks is named after “Goodman Schwerner and Chaney,” and Goodman’s mom, Carolyn, had come to my camp to talk about what had happened to her son and his two friends. So last week on our way back to Birmingham, my husband and I stopped at Mt. Zion United Methodist Church, tucked away on a rural road off Route 16 in Philadelphia, Mississippi. It’s the church where Andrew Goodman, James Chaney and Michael Schwerner spoke to the congregation about setting up a Freedom School; they later returned to investigate a fire there. It was a few miles from where those same men had been murdered in late June of 1964, then buried in an earthen dam off Route 21 next to the water tower. We arrived at the church on a Saturday just before sundown, so we didn’t expect to be able to go inside. But we were lucky—three guys doing construction on the lodge next door let us know the assistant pastor, Lindsey Kidd, was on his way and he’d surely have the keys. He did. The church is pretty tiny—only about eighty members. The community room’s wall is adorned with newspaper clippings, tracking that first fire in 1964, the reports of an FBI investigation, the national outcry, the premiere of Mississippi Burning, the eventual indictment of Edgar Ray Killen in 2005. Outside, there’s a headstone for the three Freedom Riders on the left, a standalone plaque on the right, a trio of white crosses crudely nailed together in middle of the front yard. I’ve been to civil rights landmarks before, from the Woolworth’s statues in Greensboro to the plaque on the Stonewall Inn’s bar. But right there, in the middle of rural Mississippi, staring at that famous “MISSING” poster, with a photo of a black man sandwiched between two white ones, I started to tear up and feel shivers. It was the most powerful reaction I’d ever had to a memorial, elaborate or humble. But maybe the scale of a movement and its moral purity was beside the point. I thought back to the words of Tracey Brown in New Orleans, who implored white transplants to “align themselves with these grassroots organizations”—and New Orleans residents—“that already exist, rather than creating new ones.” Moments in everyday life, not just historic movements, provide opportunities to be an ally. It’s up to us to recognize them. 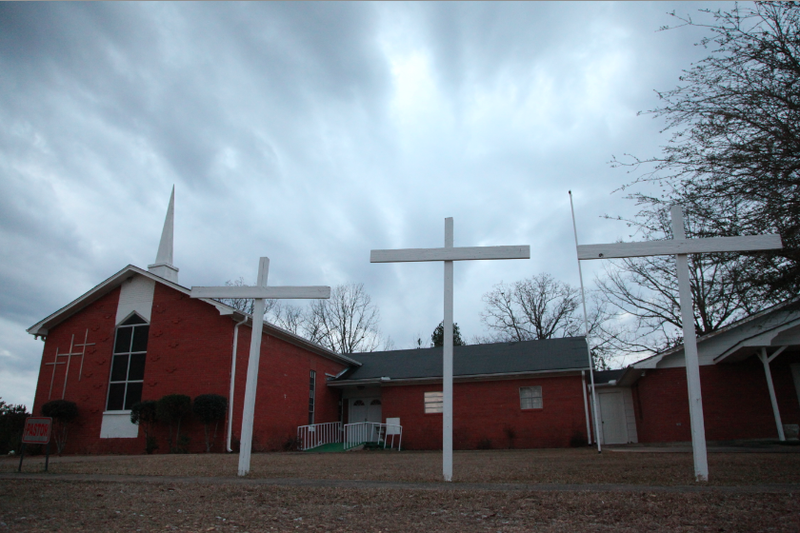 Read Nona Willis Aronowitz’s report from Mississippi’s last abortion clinic.